Structure in 0plastic laminated, shelves in glass, sides in transparent plexiglass. Backround in upholstery, tops in steel, structure in paionted iron. P5030 Single wall-mounted display unit White waterproof frame with back silk-screen printed mirrors. Five tempered extra clear glass shelves with LED lighting and anodised aluminium support. P5031 Single wall-mounted display unit White waterproof frame with back silk-screen printed mirrors. One tempered extra clear glass shelf with LED lighting and anodised aluminium support. P5017 Single wall-mounted display unit White waterproof frame with back silk-screen printed mirror-finish drawers and tempered extra clear glass shelf with LED lighting and anodised aluminium support. The City Panel unit is a bleached wood display case that features the exclusive option of an extra-clear screen-printed glass shelf. Colors: natural wood Dimensions: 53x74x181 cm Artecno design and production. Colors: PST black, metal grey Dimensions: 56x25x161 cm Shelves: 25x44 cm Artecno design and production. Colors: PST black, metal grey Dimensions: 56x12x161 cm Artecno design and production. Back lightened square display shelf. Lightened plexiglass front part and black or white plexiglas frame. Melamine structure and base, laminate wood frame. 6 glass shelves. 72 x 40 x 175 cm. Natura™Nite Bakery Box , Dark Bamboo Expand the use of your Rosseto dark bamboo Bakery Block with the new Bakery Block Cap. To use as a single drawer, simply add the cap to the top ridge to add another surface for napkins and accessories. ... single- or double-sided versions with different elements depending on what it is required to display. We present the large version of our collection of totem display stands. Entirely made in transparent glass with detail in aluminium having a polished, brushed or gilded finish. Simple and elegant, suitable for desktop or Reception we present our desktop business card holder. 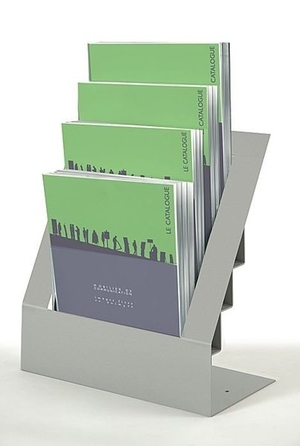 Table top holder for DIN A5 brochures. 3-mm thick transparent metacrylate with silver-matte finished extruded aluminum trim. Two-sided standing magazine rack. 3 DIN A4 per shelf . Extruded aluminum side supports with matte silver finish, painted steel shelves, and base with aluminum rail finished with glass-ball blasting. Display composed of 1 Modulo Simple and 1 Modulo Doble. Include 15 panels. The LED lighting system is optional. Wooden service counter with hinged lockable door. Decorative panel in GLOSSY WHITE, MAPLE or ROSEWOOD finish. Ships assembled. A display rack exhibits products or written materials to entice the public into learning about a product or subject, or to purchase the article on view. On ArchiExpo, these items are arranged by properties such as the type of rack and the products it is designed to hold, such as magazines. Such racks are used to offer paper, stationery, food or other products for sale in retail stores. They also display printed material in libraries, information centers and similar settings. Models include table-top, mobile and fixed, some with special features such as adjustable height shelving, built-in lighting or storage for extra items. Popular construction materials for display racks include stainless steel, laminated particleboard and wood. Consider the types of products the rack will hold and whether they will be hung, stacked or displayed in another way. Some are designed with dimensions suitable for a particular product or range of items. Others are adjustable and can hold a number of different products. The rack may be fixed, rotate or ride on wheels. Decide whether the rack's capacity or its style is more important. Racks accessible to clients may need to be especially sturdy. Those holding expensive items should be lockable to prevent theft. Ensure that the rack can support the weight of the products being displayed without compromising the stability.